******PLEASE READ***** WHEN USING INSTANT BOOKING, PLEASE CHECK AVAILABILITY BELOW FOR THE CONDO YOU WOULD LIKE TO BOOK. PLEASE ASK ANY QUESTIONS PRIOR TO USING INSTANT BOOKING. This listing advertises two 2bd/2ba condos. To help distinguish between the North condo and the South condo, underneath each photo it will say either NORTH or SOUTH condo. Want to be on the GROUND FLOOR AND BAYFRONT? Check us out! Check out our other 2bd/2ba VRBO #731218. Want to be waterfront but don't want the crowds and noise the oceanside brings? 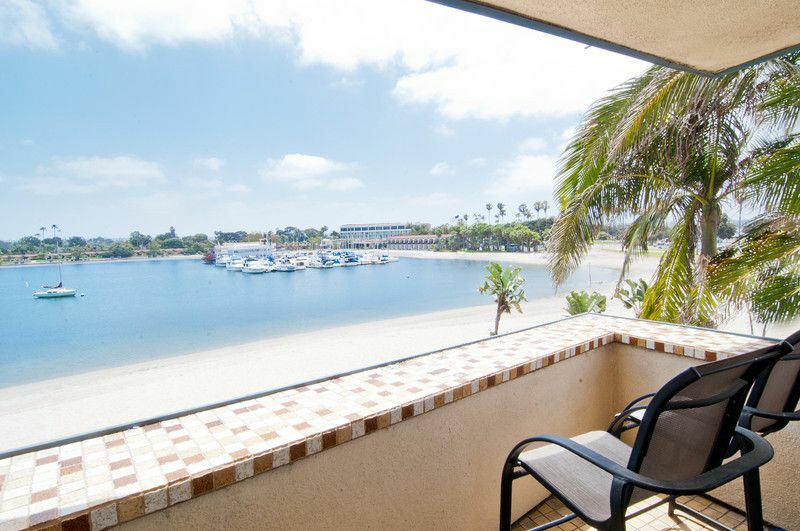 Come relax and unwind in our bayfront condo in Mission Beach! Whether you're looking for Family Fun, a Romantic Getaway or Rest & Relaxation, this Bayfront Retreat has it all! Come play at the beach or kick up your feet and drift off to the sounds of the water. Beautiful and relaxing, gated, two-bedroom, two-bath Penthouse condominiums (North Unit or South Unit with new Wood Floors) on Mission Bay in Mission Beach with 180-degree views of La Jolla Hill, the Bahia Resort Hotel, and Mission Bay. These spacious (each unit is 1,250 square feet), third-floor condominiums are perfect for families, multi-families or couples looking to get away for a nice, relaxing vacation. Sit on the patio and watch the SPECTACULAR Fireworks Show from Seaworld! Rent the condos as a 2bd/2ba or as a 4bd/4ba. Both of our condos are waterfront and across the hall from each other. Rent the entire 3rd floor out! Our 4bd/4ba set-up is great for multi-families. The secure elevator brings you right up to both front doors. Relax and unwind on the beautifully tiled and furnished balconies or catch some rays on the sand or in the water. Just steps away from the bay boardwalk, one short block from the ocean and two blocks north of Mission Bay Park & the Famous Belmont Roller Coaster! The large and spacious master bedrooms have king-size beds, an adjoining master bath, and cable TV. Open up the windows and enjoy the ocean breeze! The second bedroom has a Queen bed (South unit) or two twins (North unit), cable TV and water views. The spare bathrooms have a shower/tub. Each unit has two twin rollaway beds. There is also a crib, playpen and highchair in the South Unit and a high chair and playpen in the North Unit for the little ones! The kitchen has everything you need to serve up a feast! Lots of storage space for groceries and a breakfast bar with stools and bay views (South Unit). The living rooms have plush leather couches, cable TV and DVD player. Watch your favorite show or just relax on the couch and look out to the amazing view of the bay through the floor-to-ceiling windows. The gas fireplace is always nice for chilly evenings. Each condo comes with one covered parking space. We do not have air conditioning, but we do offer fans for your use. CLOSE TO EVERYTHING! : We are one street north of the Belmont Roller Coaster and directly west of the Bahia Resort. Enjoy a ride around the bay on the Bahia Belle. The units are just a five-minute drive to Sea World, just a short drive to the San Diego Zoo and the San Diego Wild Animal Park and a 30-minute drive from Legoland, It is also just a few miles from downtown San Diego, the San Diego Airport, and La Jolla's famous tide pools. We are walking distance to about everything - shopping, dining (Starbucks is around the corner! ), entertainment, indoor pool, arcade, carousel, roller coaster and other rides and games, grocery store, bike/skate/boogie or surf board rental shop, park, etc. Almost everything is within a 5-minute walk! Whether it is family fun or rest and relaxation you are looking for, these condominiums have it all! Please check our calendar for availability. Please note: We can accommodate standard size wheelchairs, anything longer and/or wider than a standard size will not fit into our elevator or condos. We love Mission Beach and have offered them as vacation rentals for almost 10 years. We hope you love this area as much as we do! Directly on Sail Bay, Seaworld firework views from the patios, walk to several restaurants, Starbucks is just a minute walk away, and so is the ocean! We were amazed by the beautiful bay view from inside this apartment. Absolutely gorgeous. The accommodations were very clean and we had everything we needed. Easy walk to the “big” beach and we could also send the kids just downstairs to play on the “little” beach. Just perfect! One of the best vrbo stays so far. The owner was very responsive. The place was well stocked and clean. It also felt very safe. The views!!!!!!! Hope to be back soon. Rosie, thank you for being such wonderful guests! We hope you come back and visit us again soon! We really enjoyed our stay at this condo. Loved that it was on the third story which allowed for more privacy. Great walking/running bath along the beach. Walking distance to shops and restaurants. Only 3 minute drive to Sea World which the kids loved! We had a couple questions while staying and they were very quick to respond. Would definitely recommend! Jennifer, thank you for being such wonderful guests! We hope you come back and visit us again soon! My family had a wonderful stay. The property manager was very helpful. The home was clean and beautiful. Our stay included some stormy days and it was fun staying in with the fireplace on and watching the bay. Starbucks and a kayak rental were walking distance. We also got our groceries delivered. There were great walkways along the bay and ocean. We look forward to returning! Great bay front location and close to the ocean beach too. Clean home and appreciate the third floor with a beautiful bay front view. Kitchen was well stocked and appreciate the extra TP, paper towels, etc. It would be nice to have a couple more bath towels (although there is a community washer and dryer available) Great location with an easy walk to shops and restaurants. Owner and property manager are easy to communicate with and respond quickly to questions or needs. Great view and location. Nice walking distance to everything. We really enjoyed our stay. FINAL BALANCE is due 60 days prior to check-in. PLEASE NOTE: During Peak Season (JUNE, JULY & AUGUST), there is NO REFUNDS & NO RE-BOOKING DATES if reservation is cancelled within 60 days of check-in. All monies will be forfeited. 100% refund, minus a $100 administration fee, if canceled 61+ days before arrival date. Admin fee: it takes time to re-market property and rebook dates. **An international credit card fee of 3% will be deducted from the tenant’s security deposit. U.S. credit cards will not incur credit card fees. Please consider paying with an E-Check through VRBO Pay Now to not incur credit card fees. Personal checks are accepted as well.